There is nothing I like better than a challenge so I was thrilled to hear from Nik who wanted something unique. He told me he worked for a company called nike. ‘Ah yes, I’ve heard of them’, I replied. He wanted a bespoke event created that would stimulate some great brainstorming. 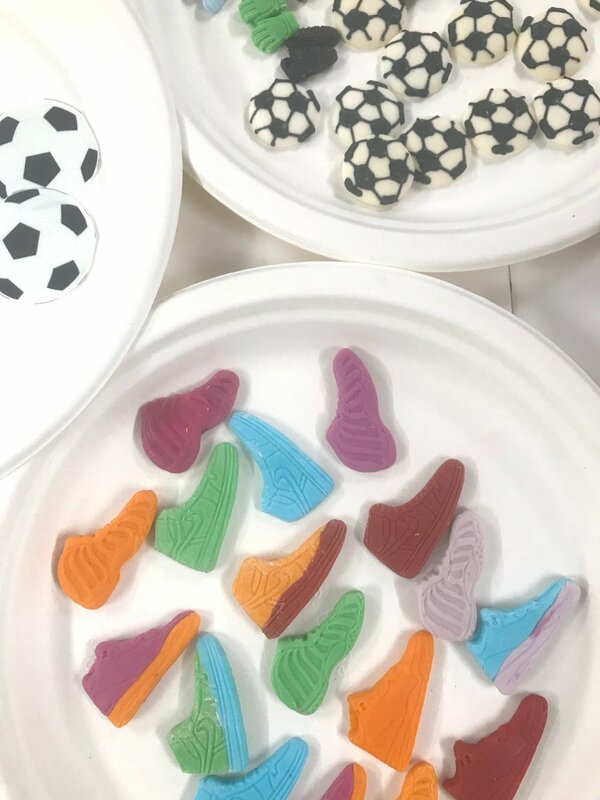 This gave me the chance to create some fab edible trainers (Nike obvs), football kits and world cups. They would use the cakes instead of a mood board and then pitch their concept. The themes they were given were; ‘Woman’s World Cup’, ‘London Marathon’ & ‘Nike Air’. Let’s just say that some of the deliveries were more successful than others and the stand out pitch was not for the winning presentation. But the first pic below shows the winning teams brilliantly executed design. They showed great focus and team work as well as an impressive technical ability with the actual piping and decorating. For me there design stood out as cohesive and well realised. The girls were thrilled with their prizes of Cookie Girl cake decorating kits. I had a lovely time teaching a private baking class to Imer and her daughter Emine. They anted to learn how to make red velvet cookies and chocolate fudge cupcakes. I’d never tried making this flavour of cookie before but soon realised that I could easily adjust my class is cookie recipe. I have to say that the results were absolutely delicious. So I thought I would share the recipe with you. Preheat oven to 190/375/Gas Mark 5. You will need a large, heavy, ungreased baking sheet. Add the vinegar, food colour and vanilla to the milk. Set aside to curdle. Cream together the butter and sugars, then add the eggs, one at a time. Now add the 'buttermilk' mixture alternating with the flour, mixing well between additions. You should now have a soft dough. Chop the chocolate into small pieces and add to the dough. Now use a spoon or ice-cream scoop to portion up balls of cookie dough. Place these inches apart on the baking sheet. Bake in the preheated oven for 10-12 minutes until they are just cooked/dry on top but still wet and gooey under the top layer. Leave to cool on the baking sheet for 10 mins then place on a wire rack to cool fully. Although Celeste Bickle now lives in Ireland she decided to host her baby shower in Central London. That way all her closest friends could be there. Bryony and the whole team at Entourage Collection had done a fantastic job creating a beautiful space for the baby shower event. They had covered every detail perfectly. Each of the place names at the dining table had a unique portrait of the guest on them. Due to the fact that Celeste had watched my cake making and cake decorating tutorials on YouTube she was really keen that I host the event. Initially I didn’t think I could do his as that week before Christmas was incredibly busy for us with a variety. In the end I managed to move things around so that I could be there for the first hour before handing over the workshop to the lovely Nadia. She was really thrilled that I’d managed to make it as I kept it as a surprise. The cake making activity was a huge hit with her guests. They did a fantastic job and loved all our new sprinkles including rubber duck sprinkles as well a baby elephants and bunnies. It was a great ice breaker for the ladies who didn’t know each other already. All in all the cake making class was just perfect for a fun baby shower activity. Celeste was such a delightful lady and her friends were very warm and relaxed. Attending the event was an absolute pleasure. It was an absolute blast working with WeWork as a part of their brilliantly curated Christmas activities and experiences for their staff. The lovely Annick had done a terrific job creating a varied and inspiring range of pursuits for both WeWork employees and members as client events. We set up ‘Pop Up’ cupcake decorating area and we were absolutely inundated by people wanting to have the opportunity to try their hand at cake making. I was really impressed by the standard of cake decorating and their were a lot of really imaginative cupcakes being created. It always surprises me when people talk about cake decorating being a women’s thing. On this occasion there were definitely a lot more men than women taking part. And there was a lot of competition between them. I always find this when we are doing team building and conference activities, the guys always take it much more seriously than the women do. It’s such a great idea to create all these varied experiences for their member’s to get involved with and fosters a real sense of community and belonging as well as a great opportunity for some networking. I have worked for WeWork before hosting a cupcake decorating workshop as a team bonding activity for one of their monthly mixer evenings. It was really fun and they were a lovely group. I was really impressed by the London Bridge venue and loved the concept of what they do and how they do it. This time working at Devonshire Square I learnt so much more about the company ethos and discovered just why their employees love working there. They are a really young company and have such a fresh approach to running a business. They are really into sustainability and have a no plastics policy. They also support refugees as their priority charity. As you know this is close to my heart with my fundraising for help Refugees through my initiative #Bake4Refugees. A lot of businesses are wary of showing support for this cause as it has become so politicised so I really admire and respect them for this. We had such great feedback from everyone and they were so appreciative of what we offered we are really looking forward to going back to do more cake events with them soon. Aquaclean had a fab idea for the product launch of their new stain resistant sofa The Monica (Gellar, natch). They invited a group of kids to set up The kids Kafe! They wanted to prove just how stain resistant their sofas were and what better way than by small people spilling sticky drinks and dropping food all over them? I was brought in to supply a fun cake making workshop for the kids to take part in between takes (The whole messy experiment was filmed to be shared on social media). The mummy bloggers and kids customers were also able to get involved in my cake class. As you can see the kids did a fantastic job with their cake making. They got vey experimental working sweets and licorice string into their cupcake designs. They even managed to master piping buttercream swirls! At the end of the cake decorating lesson they were very happy to have their cakes packed up for them to take home. A lovely surprise was seeing the fabulous Scummy Mummies who were there to interview the staff and customers in their own inimitable style. It is always a pleasure when our paths cross at various family blogger days throughout the year. Camilla wanted to celebrate her birthday by getting together with her best friends and having a cake making workshop. They had a great time. Firstly they learnt how to bake the cakes from scratch using organic eggs and real butter as well as fair trade sugar and flour. I explained how much better ‘mouth feel’ and flavour you get using real butter rather than margarine which I really don’t think is good for you. I try and use organic and free range whenever possible in my baking lessons. There was plenty of time do chat over a glass of bubbly whilst the cakes baked. We even put on Heart FM for more of a party vibe. They were a really interesting group of girls. All of them lawyers in different fields and at different companies. Some of them want us to go into their offices to host one of our popular cake making team bonding, client and networking events. We’ve worked a lot with law firms over the years. They seem to really like how well are events work as icebreakers and bonding experiences. Once the cakes were baked I showed the girls how to trim the cakes using a cake cutter (a bit like a cheese wire) and a bread knife. Then I demonstrated filling and crumb coating the cakes. Finally I taught them how to ice the cakes with a palette knife and some different styles of decorations they could finish decorating the cakes with. As you can see they each did something totally unique in the cake class They were really thrilled with the end results and excited to take them home to show to their family and friends. What a great cake making birthday party Camilla had. And who knows, perhaps I will be seeing her soon at a cake making company event in her offices! The Specialist Works were having a conference for their clients. So, Channel 4, asked us to create a ‘Great British Bake Off’ inspired cake making area to remind the brands what great advertising potential the baking show created. It was a fantastic conference. As we were right next to the stage I heard most of the speakers. My favourite was the one called ‘Be More Pirate’. It was all about being a disruptor and creating ‘good trouble’- right up my street! Our cake making conference activity proved to be a big hit with the delegates. 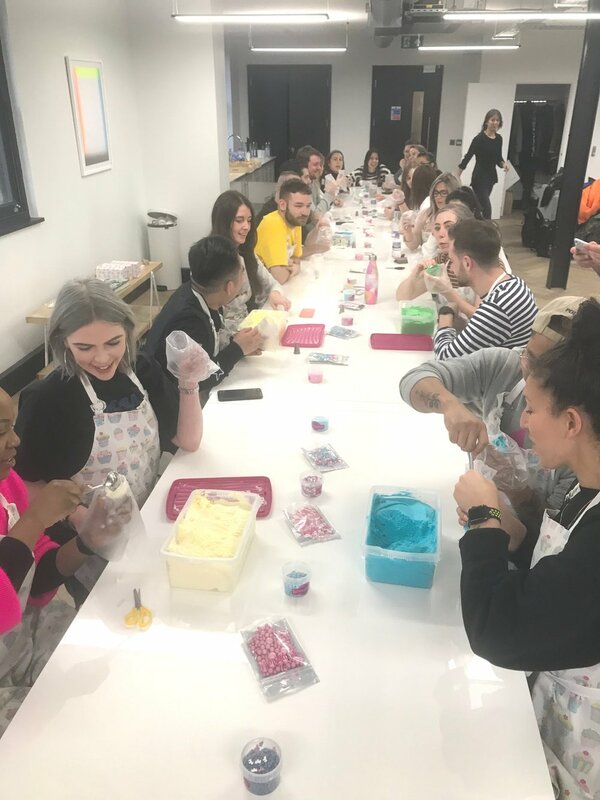 They had a brilliant time bonding with colleagues and making new connections whilst piping buttercream. The pop up cake decorating area was perfect for people to wander up to during breaks throughout the day. The guys from Channel 4 were great fun and embraced the cake making workshop wholeheartedly. In fact they really got quite competitive with their cupcake piping techniques. There were people from lots of different brands there and loads of interest in us providing cake making team bonding, networking and client events for them. The guys from The Specialist Works were absolutely lovely. I made sure I took plenty of cupcakes over to the reception area to give them a little lift at the end of the day. I had to leave before the party kicked off but they had gone to so much trouble with everything that I’m sure it was great bash. I did manage to see the brilliant ‘rap battles’ where opposing companies battled it out to see who had the ‘best game’. What an imaginatively curated conference it was. Olivia from Expedia got in touch to see if we could host a team building event for her department at Expedia. Being a multinational with offices all over the world they work in the same department as co workers on all four corners of the world. So what they do is get together every three months to have some time together bonding as a team. Obviously we were only too happy to create a fun filled cake making activity for them to enjoy. We love doing company events. We took everything required for the cake event to their offices and set up in a conference room (one of the great things about our cake workshops is that we are fully portable). They had a brilliant time making cakes creating fabulous buttercream swirls. I was pretty impressed by the general standard of cake decorating. Then the speed cupcake decorating element brought out their competitive side and led to much hilarity with a couple of cakes ending up with so much icing they wouldn’t fit in the participants mouths! All in all it was a great team event. At the end of the 2hr cake class they decided to open up the meeting room to their coworkers for them all to enjoy the cupcakes together. This was a wise move as I’m not sure the cakes would have survived the flights home. It is always such a pleasure to work with Expedia and Egencia. We were thrilled to be invited by Conde Nast Brides Magazine to do a cake making workshop at their live show as they thought it would inspire their visitors to do it as a fun hen activity. . I went to host the workshop myself and I took along a small film crew who are making a little promo for us. I really wanted to give the group of 16 a taste each of our different cupcake decorating levels. So they had the opportunity to work with cream cheese icing as well as buttercream. The girls applied themselves to the cake making lesson and got some amazing results. After piping a variety of swirls and leaves they did an amazing job on their buttercream ruffles and buttercream flowers during their cake class. Some of them were really keen on booking their hen parties with us. One girl wanted to know if we could come to Oxford for her hen do and I said that as long as it was a large group we would be able to do that. At the end of the cake decorating class they were very happy with their end results and we packed every ones cakes up for them to take home and share with their families. We are really looking forward to seeing ourselves featured in Brides magazine in a couple of months. We Work wanted to do a fun corporate event that gave the opportunity for staff members from different buildings to get together. Needless to say we were happy to oblige with one of our cupcake decorating team events. It was during a World Cup game and we took it as a good sign that three of the guys who were in the bar to watch it couldn't help but watch our cake workshop instead. We invited them to get involved and they had a great time- surprising themselves with the professionalism of their end results. At the end of the 1hr workshop we headed out onto the deck to capture the stunning London back drop in a pic. (We were in the London Bridge building) They were a lovely group who really enjoyed the laid back atmosphere of our company event. It was a perfect icebreaker and the group really bonded during the session.They had a fantastic time at the cake making workshop and were excited about the prospect of us returning to do the next level cake class.